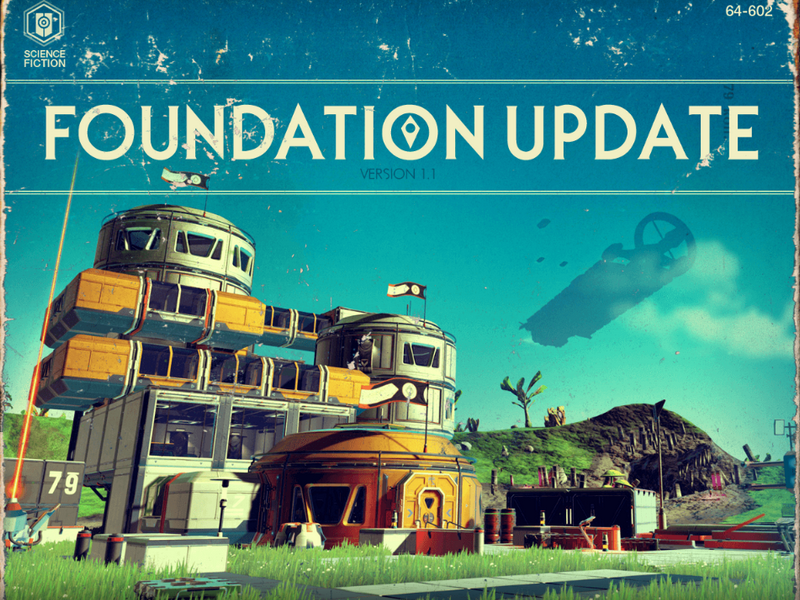 No man's sky got a huge update after over 3 months of absolute silence from the developers. Many things changed, but is it enough to make it enjoyable again? First, if you're new to NMS, here's some introduction to the drama. Hello Games has been working on the game for many years, steadily building hype and (as it turned out, sorely unrealistic) expectations. When the game finally dropped in August 2016, already 2 months delayed from the previously announced date, you can imagine what pandemonium ensued after the playerbase (me included) realized the game lacked most of the promised features, multiplayer was non-existent (this won't change, the game is simply designed for solo play) and it was essentially a screenshot generator with no gameplay past the first few hours. This was supposed to be the best game ever, promising endless hours of exploration and wonder. Instead, the set goals to explore (the mysterious Atlas, entity, and the Center of the Galaxy) turned out to be half-assed at best, the former merely showing a text message that "a star has been born" after you went through the ordeal of collecting ten un-stackable Atlas Stones, the latter simply teleporting you back to the beginning (different Galaxy, but what is the difference?). You could play NMS 1.0 for hours, but it soon became apparent the supposedly random lifeforms are just permutations of some 10 different body parts and colours, and many of the resources you could gather had no use at all, short of being sold for Units—but to what end? You could get the best ship and exosuit by simply hopping from one shipwreck and "drop pod" to another. To make things worse, after grinding your way towards a larger ship—as the number of inventory slots is the only stat that matters here—you found yourself in a situation where there's no more goals or challenges. The game completely lacked any end-game gameplay. Releasing a broken game and then going radio-silent for months sure doesn't sound like a good idea, but that's exactly what HG did post-release. A poor form of damage control, or pressure from Sony to avoid lawsuits, who knows. 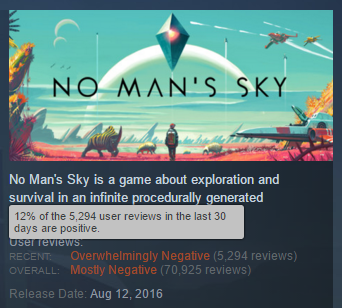 The silence, however, only made things worse: The /r/NoMansSkyTheGame started spewing one conspiracy theory after enother, and believing Sean Murray simply took the money and run sounded more than plausible. Some NMS developers even left the company to work on other projects, like Star Citizen (another overly ambitious space sim game). At one point, the moderators of the sub decided it's too toxic and should be closed down. That's where the Reddit admins stepped in and saved what was left, kicked out the old mods and replaced them with a better staff. It helped. But the sub still was full of hate and salt, which is not surprising after spending 60 euro on a stillborn walking simulator. 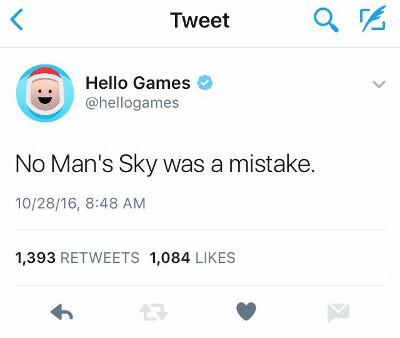 Perhaps the most awkward moment of the whole drama was when the official @hellogames account tweeted that "No Man's Sky was a mistake." The tweet was quickly taken down, purporting that it was the result of a hack. But, who knows, perhaps Sean Murray simply couldn't take Reddit heat anymore. It appeared not only the Twitter account, but also their e-mail got compromised, which is rather odd, but let's not get carried away with yet another conspiracy theory. The impossible has happened, Hello Games delivered a big update! Let's not hop back on the hype train just yet, though. What does this update bring? The ability to build bases is a game-changer on it's own. Before, you would aimlessly wander through the galaxy, gathering resources, grinding your way towards the shiny 48-slotter with the ring spoiler, but when you got there, the game was essentially over. After a while, you could't even find your way back to the nice planet with the lush purple grass meadows and ring rocks you spent so much time taking pics of. Heart breaking. Now, you claim a planet, build a base, hire a specialist to help you discover new blueprints and stuff, farm plants... it's quite similar to Minecraft, in a sense. I haven't yet gotten much further than that, so I can't say how long the novelty of quests and base building will last, but it sounds like a fun mechanic. If you google how to find a base, you'll read that you're to scan from space and it'll pop up. That may work, but I didn't have much luck. Instead, go to a planet you like, build what's called a "Signal Booster", and search for Habitable Base. There you have it, your very own base on the planet of your choosing! Go to the base, claim the planet, build a specialist terminal, go hire a Gek at the station, and you're ready to unlock new gear and stuff—just tak to your new Specialist. Freighters can now be landed in, and purportedly can also be purchased to serve as a space motorhome, which is pretty cool. Some plants and materials now require special equipment, such as Haz-Mat gauntlet or improved laser, which certainly adds incentive to searching for blueprints and completing those specialist quests. I only hope blueprints are rarer than before, where you'd get them for just shooting sentinels (which was also how you got Titanium for infinite shield regen, which is now nerfed and they instead drop some kind of purple goo). Last but not least, there are the game-modes. Normal is what you got in 1.0, except better balanced and with all the new goodies. Survival is essentially like Normal, except much harder. Exosuit drains faster, you spawn on a hellish planet that tries to kill you, Launch Booster consumes all it's fuel each time, so you have to go hunting for plutonium whenever you land outside a landing pad, dangers are greater, loot scarcer. To make it more challenging, you are constantly pestered by space pirates, so you'd better gear up for that first space-flight—except you're on this hell hole of a planet that will kill you if you don't find a cave quick enough. I tried Survival, but lasted just about that far, then wimped out to Normal. Talking of which, I strongly recommend you wipe your old save. The game is much more fun now, and if you already have everything, you won't enjoy it. The last of the modes is Creative, which is what you'd expect if you ever played Minecraft. Infinite money, no dangers, free hand to build a base or just hop from star to star and snap some sweet wallpapers. It can be also useful to try things out before spending resources on building the real thing in Normal or Survival. The update did a tremendous job at bringing the game back to life, but it also has it's fair share of downfalls. The bugs I found aren't game breaking, but they'll get on your nerves pretty fast. You still can't flight close to the terrain. Luckily, Hytek already updated his wonderful LowFlight mod, so that's a non-issue. But don't bother with the high speed / hover variants, they tend to break the game. The UI is still hard-coded for 16:9 (1920x1080). If you have other aspect ratio, like me (16:10), or 21:9, everything gets stretched and looks ugly. I've submitted a bug report for this, but don't have high hopes, looking at their general lack of communication and honesty. The PC port seems to be just an afterthought. The new update partially broke the Steam Controller support. It tries to play nice with it, and they even made an official preset, but you'll quickly find that there's a bug with the left touch-pad when trying to navigate the quick menus. Unless, of course, my gamepad is broken, but it seems to work just fine in all other games. They also broke the gyro flight control, since it's now a joystick input instead of mouse, and the game ignores mouse input when the device is connected. This means you have to hold the controller almost vertically, or you'll plunge to the ground or go into a barrel loop. Really hope they fix this, but again, they likely won't. The game is still too CPU/GPU intensive. The graphics are nice, but I can play better looking games without any problems, and NMS makes the GPU fans sound like a hurricane. I also had some stuttering issues, but they seem to have largely vanished since I last fiddled with the graphic settings. The inventory system is still buggy. This isn't a surprise, but a bummer nonetheless. You can't split a stack, you need an empty slot to craft an item even though it could readily stack with another, the craft menu tabs still can't be switched with the shoulder buttons... nothing changed in this regard since 1.0. They removed the stacking exploit, but at leats the non-stackables now stack up to 5 when in ship, which is a solid alternative. All in all, the game is much better now, but the bugs make the gameplay somewhat cumbersome. If they fix some of them in the next update, I think we'll have a game quite close to what was originally promised—short of multiplayer, of course. Article published 2016-12-04 by Ondřej Hruška.